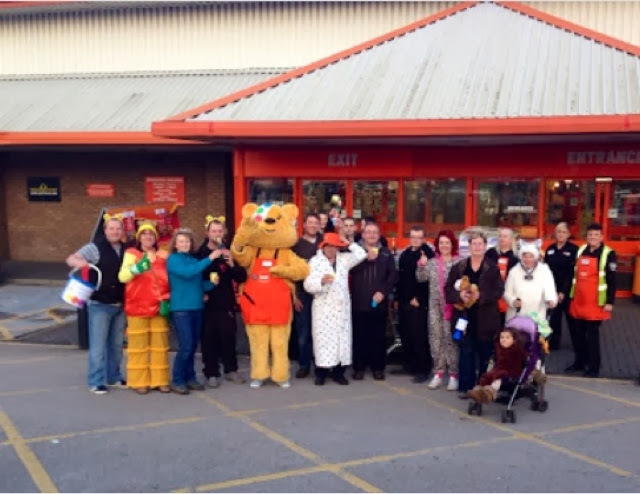 I am nothing but a mere man: Children in Need walk ..
Today I did a charity walk from the B&Q chorley store to my store in Preston, via Bamber Bridge as part of B&Q's 1 million pound pledge to Children in Need. There was 13 of us in total, including Pudsey (AKA Paul Ainsworth) himself. The day started with everyone in good nature and looking forward to the challenge of walking almost 13 miles through the heart of Lancashire. For some more than others it really was a challenge and that became evident as the day progressed. Every time I do an event for charity, I always feel very humbled to be asked to take part and this was no exception. The weather did its bit for us and the dreaded rain that was forecast stayed away. It was a bright and breezy day, with a chill in the air but once we were on our way it soon warmed up, especially for Pudsey. We got lots of support along the way and a lot of drivers and people we walked past stopped to donate and give Pudsey a big hug of course. 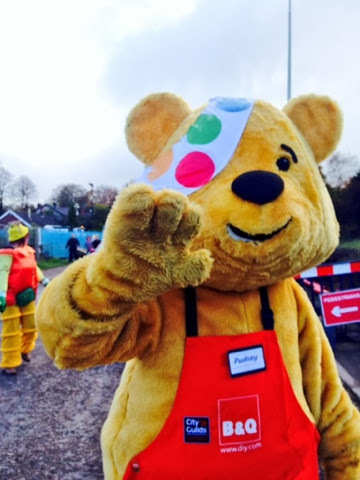 We saw mothers and fathers walking with children and seeing their little faces light up when they saw Pudsey and gave him a big hug made us all smile so much and gave us the morale booster we needed to carry on walking to help other children who need our help. One of the best moments of the day was when we walked past a Primary school and all the children were on their break, when they saw Pudsey they could not contain their excitement and all went a little bit crazy. Good luck to whoever had to teach them this afternoon. We didn't quite get a huge welcome party at Bamber Bridge when we got there, but alas it was time for a quick pit stop and chat to to some of our colleagues who worked there. We then had a bit of a lunch break at Morrisons where unfortunately Pudsey had a bit of an accident and walked straight into a ballard, Clumsey Pudsey :P. But like a true professional he carried on waving to his adoring crowd and we all collected a bit of money from the shoppers there. I don't think the Dogs Trust were too happy, but hey you can't compete with Pudsey. The final stretch and 2 miles from home, well my store anyway and a nice woman pulls up and donates £40 and wishes us good luck on the rest of our journey. Some people were clearly struggling at this point but they carried on and that womans generosity gave each and every one of us the determination to get to the end.